Founded in 2009 by a group of then Google employees, Anker has made a name for themselves in the world of smartphone accessories. Known for reliable cables, chargers, and power banks, the company has also delved into the audio market, producing various lines of Bluetooth speakers and headphones, which, like their other accessories, became known for their reasonable price, and solid performance. While the company may not be the most prominent name in audio technology, they’ve drawn comparisons to heavy-hitters like Bose and JBL. 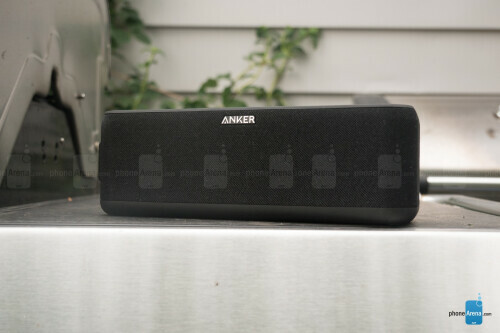 Today, we take a look at their SoundCore Boost 20-Watt Bluetooth speaker to see if these comparisons are warranted, or simply made for the sake of comparison. 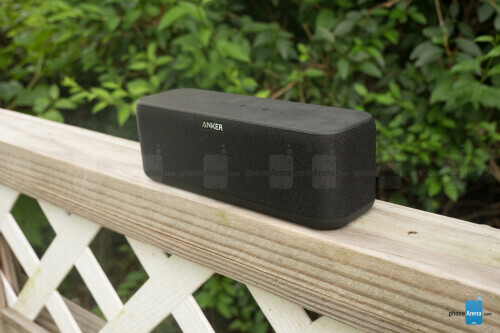 Compact all-black build reminds us of a smaller, more rugged soundbar. 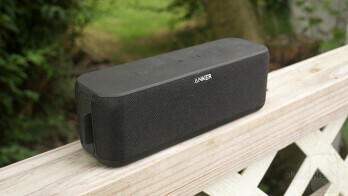 The SoundCore Boost has a rather non-descript look about it, which isn’t necessarily a bad thing. 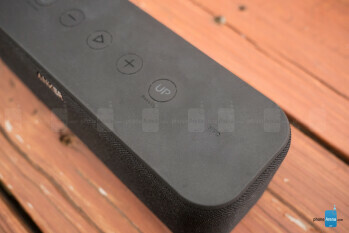 Being a flat, all-black device, with round edges, it almost looks like a miniature sound bar – so there is a level of refinement to it. Unlike the JBL Pulses of the world, this speaker’s not meant to be looked at, so much as listened to, and we’re OK with that. 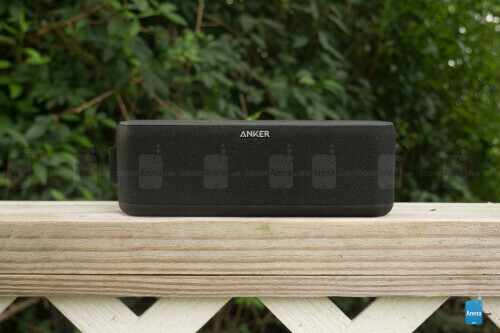 A fabric speaker mesh wraps all the way around the device, save for the left side where a small rubber flap exists to protect the speaker’s USB charging output, micro-USB charging input, and auxiliary input. The flap is very snug and secure in the left-side frame, mainly to keep water out. The device is IPX5 rated, which means it can withstand splashes, and even lighter jet streams of water (think super soaker), but it’s not fully submersible nor is it rated at all for dust resistance, though Anker does have a similar device that is. Atop the speaker’s flat, rubberized surface you’ll find a set of battery indicator dots, composed of four small white lights, as well as raised control buttons for power/pairing, volume up, play, volume down, and a button labeled “Bass Up” – in that order. The Bass Up button toggles the eponymous listening mode, which is meant to, you guessed it, add a bit more bass to the overall sound. The raised rubber on these buttons make them easy to find without having to look. It’s quite a compact device – measuring only seven and a half inches in length, two and a half in height, and two and a quarter in width. The SoundCore Boost will easily fit in backpacks, purses, and maybe even a clutch. We were a bit disappointed with the included charging cable. Measuring at 21 inches in length, the less than two-foot micro-USB cable doesn’t come with a wall charger. We simply used our micro-USB chargers laying around from old phones, and never bothered with this awkwardly sized cable or its lack of a wall component. This could prove a bigger annoyance for iPhone owners and those who use USB-C charging cables, though, as they’ll be forced to leave the speaker on the ground while charging. That means playing music while charging will be a less than optimal experience for these users unless they buy a longer charger. Easy to use, easy to connect. Aside from the buttons described, the Boost also has NFC, which gives users a quick and convenient option for pairing. The device is very easy to pair through Bluetooth as well, but we’d rather have NFC and not use it than the other way around. It’s a touch of convenience we wouldn’t mind seeing on more speakers, especially with NFC becoming so widespread. 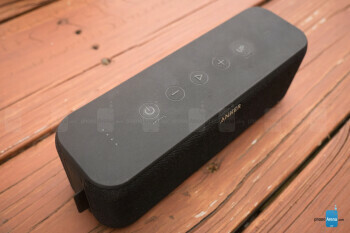 Anker’s speaker doesn’t come with a companion app or any other special features; just a run-of-the-mill Bluetooth speaker here. That means you won’t have extra features like the ability to daisy-chain speakers, or enable voice assistants, like you have in the newest JBL Flip, for example. You can still call up your voice assistant the typical way you would on your _phone_ and it’ll play through the speaker. Just like the Flip, you dictate to the voice assistant through the speaker’s microphone, not your phone’s, so the only real difference is the Flip’s ability to call up the voice assistant via a button on the speaker itself. 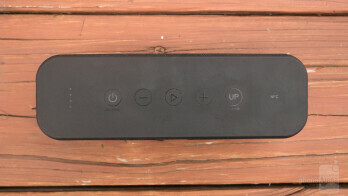 In our opinion, it’s not an enormous loss, but in the expanding world of assistant-driven Bluetooth speakers, adding this small bit of functionality – perhaps with the ability to recognize hot phrases (Hey Siri, OK Google) – may be worth it in the next generation, if only to add a modicum value. The biggest annoyance here, relatively speaking, is the fact that when you’ve clicked up to max volume, the music stops entirely for about a second to emit a single beep letting you know you’ve reached the peak. A small touch like slightly lowering the music to make this sound gives a more refined feel, and doesn’t stop your dance party so awkwardly and abruptly. You can get around this by turning up the volume from your device, rather than the speaker, but the max volume notification here is a short, almost inaudible beep, that doesn’t affect the music in any way, making it both unobtrusive, and ineffective. Lowering the volume slightly and emitting the beep would be a better alternative here, as well. Other than this, the only other small oddity we noticed was the fact that you can’t turn off the speaker when on a _phone_ call with the currently connected phone – even if you’re not using the speaker for the phone call. This was a strange development, for which we didn’t see the purpose. It only served to needlessly drain battery while on a phone call. Though the drain shouldn’t be too impactful, depending on the phone call length, we suppose. Either way, if you want to save that battery life, you have to hang up with your caller first, turn off the speaker, then call them back. The speaker does have a microphone for calls, so you can use that, but doing so can sometimes be problematic. In our testing, those who we called through the speaker complained of an echoing issue, where they could hear themselves speaking a second or two after they had finished talking. This issue would persist throughout the phone call, and sometimes inexplicably stop without us changing anything. The echo was there more times than not, however, so if speakerphone is one of the main purposes of your Bluetooth speaker, you may want to look elsewhere. Otherwise, on the caller’s end, the Boost does reproduce voices decently well, albeit not crystal clear. 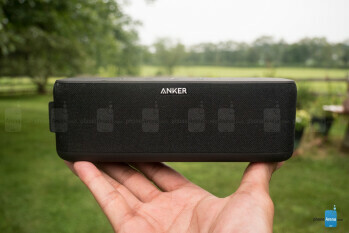 The inclusion of Bluetooth 4.2 adds exceptional range to the SoundCore Boost, easily maintaining connection through about 56 feet of distance with multiple rooms and walls in between, and getting darn near the 66 feet promised by the Bluetooth standard. Sometimes devices, irrespective of Bluetooth version, have trouble maintaining a good connection even well within their range. The Boost’s performance here was rock solid. Well-balanced, full sound that can get pretty loud too. Pound for pound, this little speaker produces some impressively loud and balanced output. Especially considering the size of the two drivers and dual woofers in this speaker, it shows quite a capable range. All genres at all volumes sounded clear and enjoyable – not too bright, and not too heavy. Highs aren’t exactly glass shatteringly clear, a characteristic you’d expect on high-end sound systems, but sonically, it never lacks for treble. Similarly, bass won’t be knocking pictures off the wall, but in the context of its own sonic profile, the lows provide a good rumble to anchor the sound. Enabling the “Bass Up” option is a must in our opinion. Not that it sounds at all anemic without it, but turning it on bridges the mids and bass more than it does just add some “thud.” Overall, it contributes to a richer sound, especially at higher volumes. Bass Up’s effect is noticeable at all volume levels, but the best fidelity seems to come in the mid-range. Every click up on the volume from here decreases the bass’s presence some, adding more to the mids and treble as you climb in decibels. This effect is much more noticeable with rock music, and less so with rap, for instance. Regardless, this means that at peak volume, though the overall sound is good, the bass is at its weakest. That’s not to say that the woofer doesn’t still make its presence felt at top volume, especially in rap songs with very low bass tones. But with rock, the bass lines, snares, guitars, and vocals will be most in harmony at the mid-level of the volume scale, and in our opinion, sound best with Bass Up enabled. With or without Bass Up, the speaker provides a listening experience that’s clean and maintains composure very well – even at peak volume. Ultimately, it will depend on your musical tastes whether to enable Bass Up or not, but we’re glad it’s there. On the whole, sound quality and volume were surprisingly high. We weren’t expecting bad sound – many speakers have shown that good sound can come in small packages – but we didn’t expect it to be as loud as it was, or maintain its composure as superbly as it proved to do at higher, room-filling volumes. Anker doesn’t specify the exact size of the battery packed inside this compact device, but its built-in USB-A port is Charge IQ enabled, offering a potent 5,200 mAh of charging power to other devices; so, we can assume the battery is at least this large. Charge IQ is Anker’s charging technology which specifically tailors its current to the device it’s charging, ensuring a healthy and efficient charge. The Boost is rated for twelve hours of playback time, but of course, circumstantial factors, like volume and charging other devices can bring this number down. 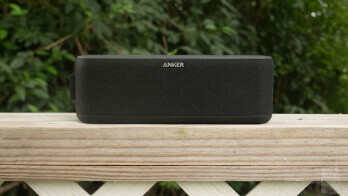 Anker’s built a reputation for high-quality accessories, and their line of speakers seems to follow in that trend. 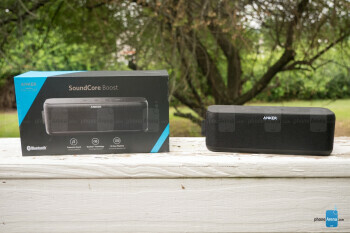 The SoundCore Boost, is a small, classily designed Bluetooth speaker with impressively balanced and composed sound. Not to mention, the fact that this little speaker can fill rooms with sound, and power-hungry devices with juice, without breaking a sweat. IPX5 rating isn’t bad to have either. 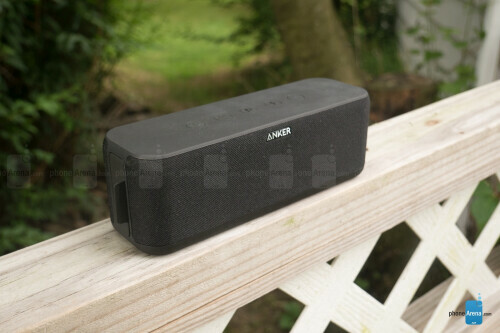 Although it’d be nice to have full IP68 protection, Anker does have a speaker for that, and it’s in the same price range as the Boost, which retails for $79.99. JBL’s flip and Bose’s Soundlink Mini are two of the most popular speakers in this category, and the Boost certainly gives them a run for their money in sound quality. Speaking of money, the Soundlink retails for $100 more at $179.99, while the latest JBL Flip sells for $90. At this price point, the Boost offers a lower price, competitive sound, and a smaller frame than both, making it a must-see (hear?) device in this category.